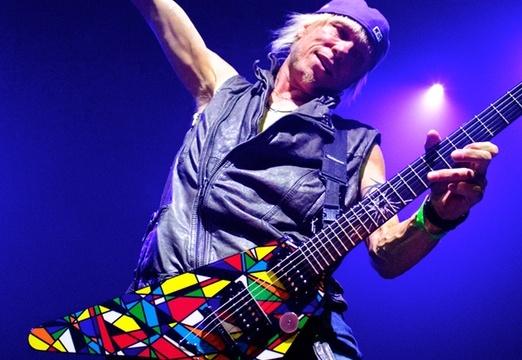 See the gallery for quotes by Michael Schenker. You can to use those 7 images of quotes as a desktop wallpapers. I believe that every person has uniqueness - something that nobody else has. If you copy then it is not self-expression. Even when I was very depressed, I could hold on to something. It seems that I have always had that streak of gold that I could hold on to. I love to be creative. 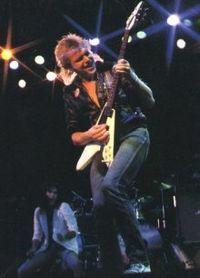 I play with feeling so I need to hear what is coming out of the amplifier to inspire me; I don't just play mechanically. I need to hear what I am doing in order to create the next note. If I don't hear it then I can't feed myself. In order to get somewhere in life, you need to have a vision. The vision brings you to the table. Without a vision, you just do what everybody else does and you are just there. I have made stage adjustments which allow me to hear myself better onstage so that has made playing live much more enjoyable. It would be a dream come true if I could just go from studio to studio and play solos. When you are live you never know what is going to happen. I have always known that it comes from deep within myself. I always knew what sound I wanted, and how I wanted to play. I knew everything, it just had to be developed. If you are a musician and you don't show any interest on the business level then you are actually vulnerable and people will rip you off. They will sweet talk you into anything. 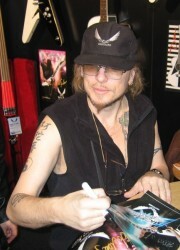 If you are in a band like my brother, Rudolf, who is in the Scorpions, then you have a kind of umbrella and you cover each other. 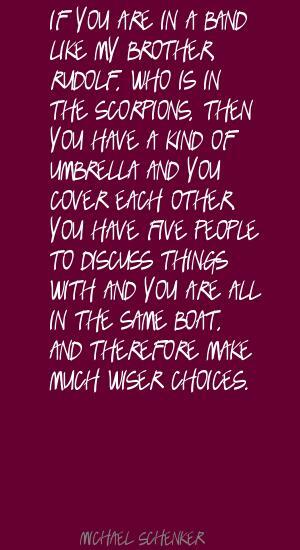 You have five people to discuss things with and you are all in the same boat, and therefore make much wiser choices. Phil has always been a fighter. He was getting in fights all the time. I told him that if he ever hit me then I would leave the band. He wanted to find out if I was telling him the truth. He hit me so I left and that is how UFO split up. The music is a personal expression, like art. It is something that you like doing that comes from within, and is an expression that comes from God. That is why artists are beautiful and why people who copy are not really artistic.